In the coming days, Ontario’s Progressive Conservative Party will attempt to grab headlines with a phony plan to tackle the budget deficit by reforming health care delivery. It will be a phony plan, because it will propose no reduction in health care spending and so will have no impact on budget expenses. Health care already is privately delivered. Physicians are not government employees. They are private business persons who are paid by the government for the services they delivery to patients. Private clinics, similarly, are paid by the government. If Tim Hudak’s PCs refuse to de-list health care services and refuse to cut health care spending, government money simply will go to more private clinics instead of to hospitals (some of which are, likewise, privately owned). Increased delivery efficiencies can have no effect on the budget if the government’s health care spending is not reduced. So long as the Progressive Conservatives maintain that they will not actually cut spending on health care, any promised increase in delivery efficiency will not reduce government spending and so will not decrease the budget deficit. Even were it possible to find efficiencies sufficient to prevent increases in health care spending, any balancing of the budget would not be attributable to such efficiencies. Rather, such balancing would be attributable only to increased revenues, or to decreased spending on other matters. to distract from condemnation the PCs have been suffering as a result of union bashing. 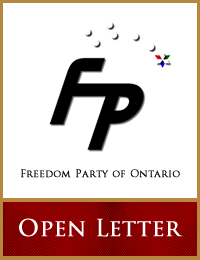 In Freedom Party of Ontario’s 2012 Opposition Budget proposals, and in our recent by-election commercial, Freedom Party criticized Dalton McGuinty and Tim Hudak for false promises to eliminate Ontario’s massive budget deficit without reducing spending on health care and education. The Tim Hudak PCs’ recycled proposals to “increase efficiencies”, “reduce red tape”, “eliminate waste”, etc. in the delivery of health care will not change the fact that will remain after the release of the PC white paper: Ontario’s PCs, like the Liberals, have no authentic plan to eliminate Ontario’s budget deficit. Paul McKeever, B.Sc. (Hons), M.A., LL.B.